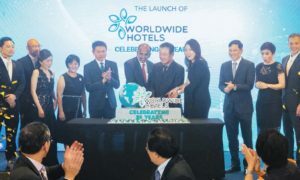 Singapore (Singapore) – October 25, 2018 (travelindex.com) – Worldwide Hotels was officially launched in Singapore, marking the consolidation of V Hotel, Hotel Boss, Hotel Mi, Value Hotel, Venue Hotel and Hotel 81 under one group. The launch event at Suntec City Convention Centre was attended by over 300 guests, as well as guest of honour, K Shanmugam, Singapore’s minister for home affairs and minister for law. In celebration of the occasion, which commemorated the group’s 25th anniversary as well, Worldwide Hotels-Choo Chong Ngen Foundation donated S$2 million (US$1.4 million) to the Institute of Technical Education and S$50,000 to Chong Pang CCC Community Development and Welfare Fund in support of providing assistance to students from lower income families. The consolidation is said to give Singapore its “largest homegrown tourist class hotel group”. Worldwide Hotels also plans to expand beyond the lion city, from its current overseas portfolio of eight properties. In Singapore, Worldwide Hotels owns and manages all of its properties here spanning 38 properties and over 6,500 rooms, across the six brands. Beyond its home ground, Worldwide Hotels continues to expand its presence and has acquired properties around the world. With the first hotel established in 1993 by Group Chairman Mr Choo Chong Ngen, Worldwide Hotels has been steadily growing its portfolio and is rapidly expanding overseas with over 8 properties around Asia Pacific. More developments are in the pipeline as the Group continues to grow its footprint at home and beyond. Worldwide Hotels will be celebrating its launch in conjunction with the group’s 25th anniversary in October 2018. Worldwide Hotels is the largest homegrown tourist class hotel group in Singapore. We currently own and manage all of our properties in Singapore. With the first hotel established in 1993, we have grown from one to six hotel brands spanning 38 properties and over 6,500 rooms. Worldwide Hotels offers a full range of hotel experiences, ensuring guests will always find a brand that will suit their needs. Guests can choose from six hotel brands including Hotel 81, Value Hotel, Venue Hotel, V Hotel, Hotel Boss, and Hotel Mi, each with its own distinct personality and concept. Worldwide Hotels continues to expand its presence and with the recent acquisition of 8 hotels in Asia Pacific, we are rapidly expanding our international footprint. Our vision is to be the leading Singapore hotel group worldwide. Book your hotel in Singapore and around the world in 55 countries at best rates available. Earn HolidayClick Points and pay at the hotel. Book now at HotelWorlds.com!